Blackpool boss Gary Bowyer says he is out to right a wrong when his team take on the Cobblers in Sky Bet League One on Saturday - providing the Bloomfield Road pitch passes a Friday morning inspection. The fixture on the north west coast is in serious doubt due to the freezing temperatures that have blighted the country this week, but if it goes ahead, Seasiders boss Bowyer will be gunning for revenge. 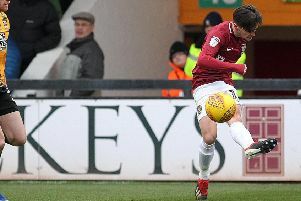 Blackpool were beaten 1-0 at Sixfields back in October, with Sam Hoskins’ first-half strike enough to secure the three points for Jmmy Floyd Hasselbaink’s men. Bowyer was furious after the match, labelling his team’s performance ‘an embarrassment’ and ‘unacceptable’, and added: “We were nowhere near the levels that we’ve set this season with how we played. “It was an awful game, an absolutely awful game, and I apologise to our supporters in particular for making that journey down and for the level of performance we gave. The Blackpool manager is now hoping his players can put things right this weekend by seeing off the Cobblers. “We didn’t turn up that day, one of the few times that has happened this season,” said Bowyer. Bowyer has overseen an improvement in Blackpool’s form in recent weeks, and they were impressive 2-0 winners at Portsmouth last weekend, but they are without a win in their past 10 home games. The Cobblers have also had their troubles on home soil, but they are unbeaten on the road in 2018, and Bowyer is a big fan of Hasselbaink. He has been impressed by the job the Dutchman has done at Sixfields since taking over from Justin Edinburgh in September, with the team rock bottom of league one having lost all four of their matches. “I like Jimmy, I like him a lot,” said Bowyer. “He did phenomenally well at Burton and he went in at a difficult time at Queens Park Rangers. There is a pitch inspection at Bloomfield Road on Friday morning. The pitch has been covered since Monday morning, but a statement on the Blackpool website read: “The club’s pitch protection covers are effective down to -4 degrees, however with the wind chill reaching -8 last night (Wednesday) and the cold snap set to continue, the two clubs and The EFL have agreed for a referee to make an early inspection.